This entry was posted in Costume, Fine Art, Goya, Interior Decoration, Portraits, Visual Arts and tagged Billy Baldwin, cats, Duveen, European Art, Fine art, Gilbert Miller, Goya, Jukes S Bache, Kitty Miller, magpie, Manuel Osorio Manrique de Zuñiga, Mark Hampton, Metropolitan Museum, New York, Spanish art, Visual Arts. Yes the female figures look out, ref the earlier thread, Goya is often claimed to have been somewhat pushy, perhaps earlier artists were simply afraid to get more involved with the patron’s relatives, or too polite? Rather than any overt politics. 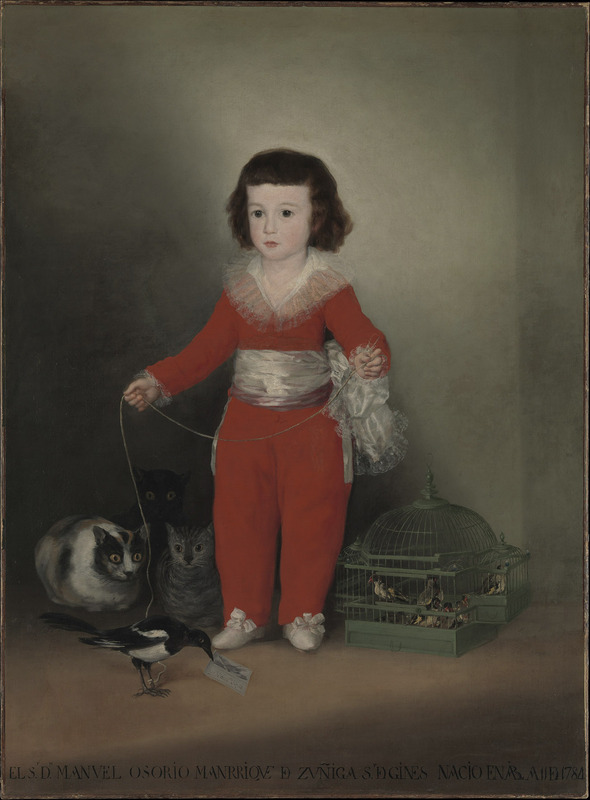 Love the cats and birds, and how the magpie, Goya, himself? The show is good I was there last week, some fine jewellery like the sitters wear is also showing & for sale in the foyer bookshop, to dress up with, including fans – these can be useful when the show is crowded. Also Giacometti is showing at the NPG round the corner.